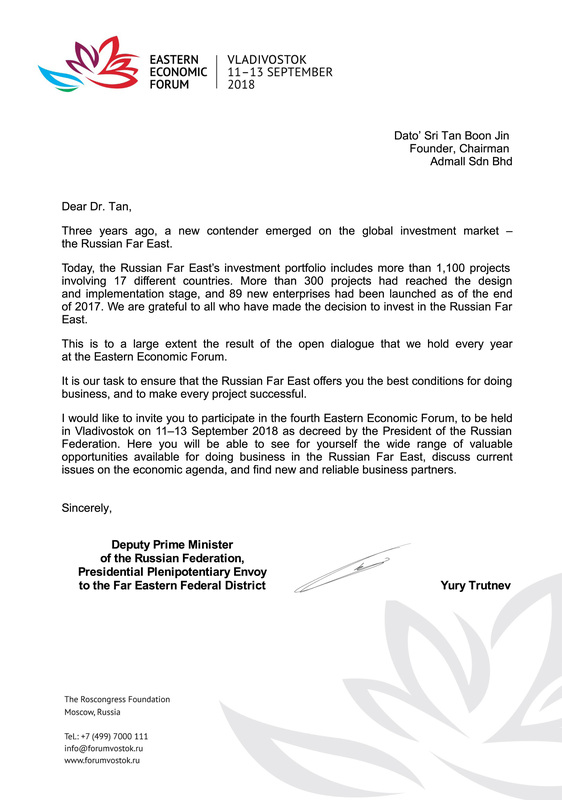 Admall Founder and Managing Director, Dato’ Sri Dr Patrick Tan and Cannis Group Chief Executive Officer, Dato’ Azman Ching were invited to attend the 4th Eastern Economic Forum that was held in Vladivostok, Russia from 11 till 13 September 2018. It was an exclusive invitation that was only sent to both of them as the representatives for Malaysia. The invite was written by the Deputy Prime Minister of the Russian Federation, Presidential Plenipotentiary Envoy to the Far Eastern District – Mr Yury Trutnev. The speakers for the forum were Russian President Vladimir Putin, Mongolian President Khaltmaagiin Battulga, Japanese Prime Minister Shinzo Abe, South Korean President Moon Jae-In and China President Xi JinPing.